2.1 Google Drive Folders and Network Drives are the Same? NOTE: If you have about ten minutes, the video tutorial shows animations that help understand the concepts that will be described below. Sometimes (such as in this case) video just explains concepts better than text and images. Google Drive Folders and Network Drives are the Same? 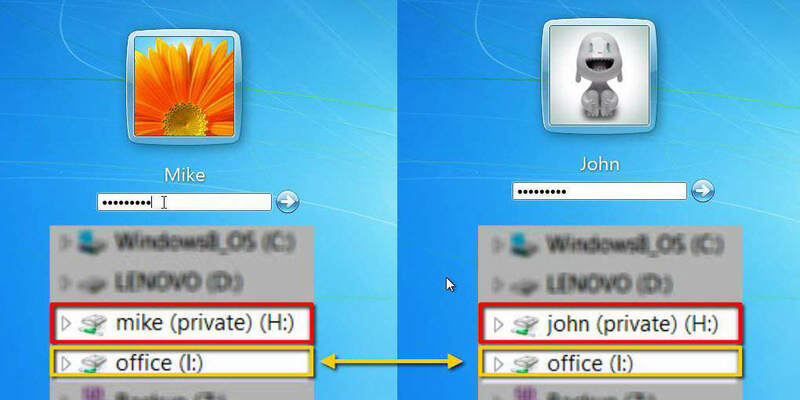 In an office, when a user logs in, there is usually network drives associated with the user. There is often a network drive coded for the user and a public one for the office/team that the user is part of. Behind the scenes, IT staff have setup these drives so that all the user needs to do is login to see them. Google Drive Folders are like these network drives. However, there is no IT staff to help setup Google Drive folder sharing. Therefore, to share folders correctly, new concepts about folder permissions must be considered when sharing folders. 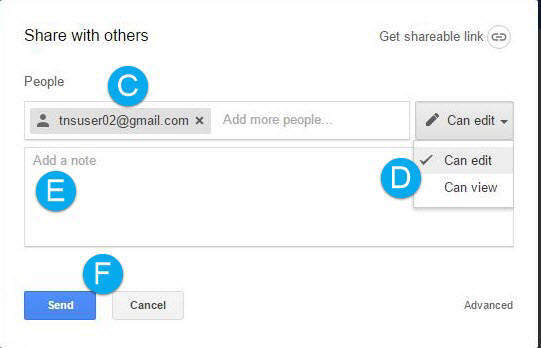 To share a folder, begin by clicking on the desired folder (A) and then clicking on the share icon (B). A popup will appear where you can add the recipient’s email address (C), choose the level of editing permissions (D), add an optional note (E) and then confirm the settings by click on the “Send” button (F). The recipient will receive and email stating that you have shared a Google Drive folder. The link will take the recipient to the web view of the folder, where he/she can add the folder to their Google Drive. When sharing a folder, the share permissions of the folder will cascade into its files and sub-folders. If you share a folder as “Can view,” the recipient will only be able to view the files; if you share a folder as “Can edit,” they will be able to make changes to any file within the folder. ASIDE: It’s called cascading much like water cascades down a waterfall. 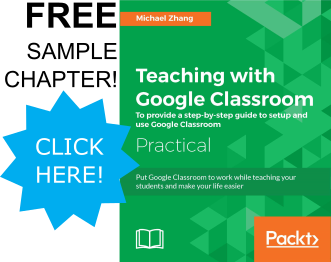 During many Google Drive training sessions, one of the most common questions revolving Google Drive is the difficulty in finding files in Google Drive. Users will share or be shared a folder and not be able to find files afterwards. Many of these issues revolve around sharing Folders with the “Can edit” permission. This inability to find files in Google Drive has lead to the new option to “Locate in Google Drive” files that were searched for. When a folder is shared with “Can edit,” editors are able to choose which files appear in the folder. In other words, they are able to change the file structure within the folder. Therefore, if they choose to move a file out of the folder, no-one else who can see the folder will have access to that file. In fact, if you share a Google Drive folder with “Can edit” privileges to someone and they move files out of the folder, you will have difficulties finding the file afterwards because those files will not be indexed in your folders. In the above example, tnsuser04 moved File4 into his/her My Drive from the shared Documents folder. Subsequenctly, all other users no longer had access to File4. To find those files again, the you would need to first search for the file and then move it to a folder. Searching for a file includes typing in keywords in the search bar (A) to find the file, select the file (B) and then clicking on the “Add to My Drive” icon in the menu (C). To avoid this confusion, share folders with the “Can view” permission level. If a folder is shared with a user as “Can view,” the viewers will not be able to edit which files appear in the folder. They will only be able to manipulated the folder in its entirety. Editing privileges can be granted to individual files after the folder itself has been shared. If individual files within a Google Drive folder already have file permissions, sharing a folder as “Can view” will not change those file permissions. However, if the folder is shared with “Can edit,” the folder permissions will cascade into all the files within and change them all to “Can edit.” However, the user can then go into the individual files and change the permissions afterwards. In the above image, if this folder was then shared as “Can view,” none of the individual file permissions would change. However, all would become “Can edit” if the folder is shared with “Can edit” privileges. Google Drive revolutionizes file management by adding features and storing files on the cloud. However, with the ever growing list of features Google Drive and other cloud storage options provide, the need to better understand file permissions becomes more evident. Whether it is accidentally sharing a spreadsheet of employee salaries to the entire company or thinking that you have shared a folder, but did not. Simple errors within Google Drive and other cloud storage and sharing systems can lead to hours of time wasted in correcting those errors. Now with these new concepts, hopefully more time is saved than wasted when sharing large amounts of files.